Our service pricing is affordable. We also do business and organization histories. Just send us an email and we will provide a custom quote. This packrat has learned that what the next generation will value most is not what we owned, but the evidence of who we were and the tales of how we loved. In the end, it's the family stories that are worth the storage. *Price includes 1-hour interview session, transcription, design, scanning of 20 family photos, PDF version of Personal Life Story Book and 1 DVD copy. 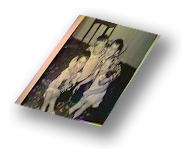 Add $7.50 per additional photo; $7.50 for additional DVDs. Includes travel to your house up to 20 miles from our location in Lowell, IN. Mileage charge applicable beyond 20 miles. All prices subject to change. A quotation is good for 30 days.